Teenagers will be working towards free expression and abstract ceramics and the younger element will be more project oriented. Mixed family age groups work extremely well together and is an excellent social experience. But you must bring an old shirt or apron. - please pay in the first week of each term. The Skills section of the Duke of Edinburgh Award Scheme is all about developing practical and social skills and personal interests. By choosing to develop a particular skill, such as pottery, you are not only developing a new talent but you will also boost your self esteem, develop practical and social skills and learn how to set and rise to a challenge. If this isn't enough, it should also be good fun too! You have to do your Skills section for 6 months each at Bronze and Silver levels. More information is to be found at the Skills requirement section of the DofE website by clicking here. All aspects of clay work are covered: hand building, modelling, sculpture and wheel work. Groups are small and of mixed ages. The Secondary School age group are guided more into free expression and abstract work and on a more personal level. The value of clay as an educational medium has been discussed widely and the media have rightly aired this subject for the benefit of all. Children and young people who are lucky enough to have a chance to work with clay have found that, through expressing themselves with something tactile and three-dimensional, they are better able to cope with the tasks of school and student life. 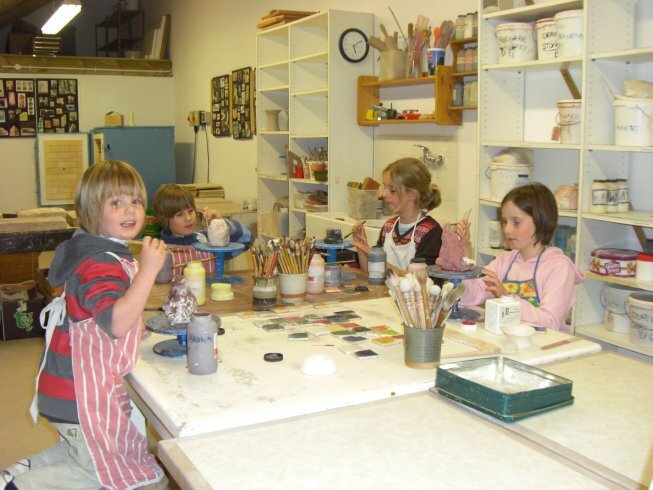 Development of language, freedom of expression, relaxation, patience and the many other educational attributes associated with ceramics, give the children more confidence and a real sense of achievement. Only by having a hands on experience can they realise the value of this medium and their full potential. Many young people have attended holiday courses and other classes, but a regular session once a week can be very beneficial.